The EXP-LED-HL-X2 Intrinsically Safe LED Headlight is ideal for a wide variety of uses including Industrial Safety, Public Works & Utilities, Law Enforcement, Hardware/Tool, Automotive, Marine, Sporting Goods and Consumer applications. Three high intensity LED emitters mounted within a lightweight housing provide up to 18 hours of useable light and can be either worn on the head or attached to a hard hat with the included elastic or rubber straps. The EXP-LED-HL-X2 explosion proof LED headlight from Larson Electronics produces an intense light beam while providing up to 18 hours of illumination. Three high intensity LEDs mounted within an impact resistant housing is powered by 3 AA batteries to produce a long lived light beam of up to 170 lumens in output. Included with this explosion proof headlight are an elastic headstrap and a rubber hard hat strap to allow users to either wear the unit directly or mount it to their hard hats for ease of operation. 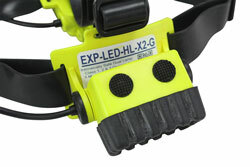 Featuring a housing constructed of impact resistant engineering resin that has been drop test verified from 2 meters, an unbreakable polycarbonate lens, and an IPX7 waterproof rating tested at 1 meter, this headlight provides users with a highly convenient and safe light source that leaves their hands free for work operations. 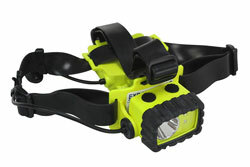 This headlamp features three high output LEDs for up to five modes of illumination. 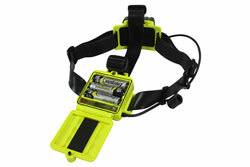 The adjustable rubber straps allow this unit to be mounted to hard hats without slipping, and will fit all head sizes. Two rubber dome push button switches allows easy operation between modes even when wearing gloves. The right push button operates the spotlight, whereas the left switches between full power floodlight, half power floodlight, and red floodlight. The spotlight produces 100 lumen and a beam reaching over 450 feet in distance with an 18 hour runtime. The full power floodlight produces 90 lumens with a 13.5 hour runtime. The half power floodlight produces 20 lumens with a 75 hour runtime. The red floodlight produces 18 lumens with a 37 hour runtime. Operators can activate both spotlight and floodlight beams for up to 175 lumens and a 6.5 hour runtime. ETL Classified Class I, Division 1, Groups A, B, C, D, Class 2 Division 1 Groups E, F, G, Class III Temperature Code: T4, this light is safe for use in environments containing gases, vapors and various dusts. This unit will operate for to 18 hours on a fresh set of AA batteries, and as battery power drops, output declines to 25% at the end of battery life. Note: Hard hat shown not included. 2. High efficiency and low amp draw. 4. Small size and light weight. 8. Consistent color over time. 10. No fragile glass used in construction.